I love busting myths about the FODMAP Diet because knowledge is power! In last week's post, I explained why "less FODMAPs = less symptoms" isn't the full story. The end goal isn't to restrict all high-FODMAP foods forever - It's finding your unique IBS triggers so you can bring back foods that don't cause your stomach issues. 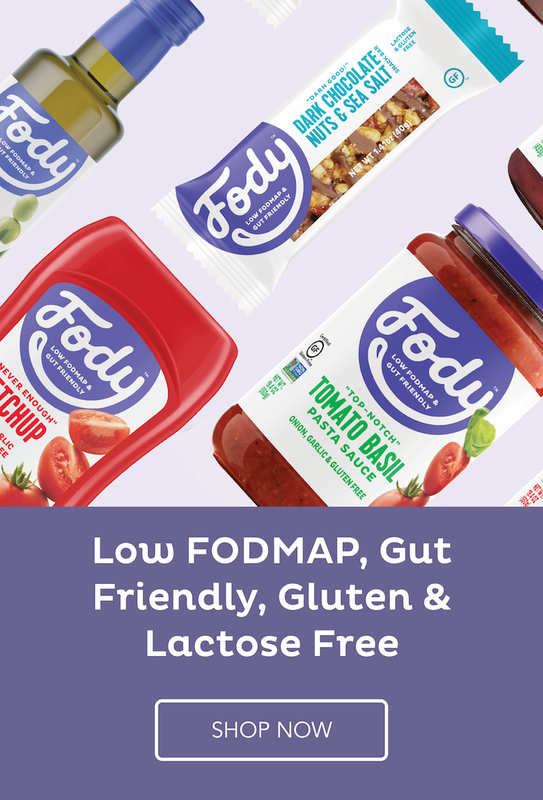 Whenever I talk about finding IBS triggers with friends or the CBK Facebook community, I see lots of hesitation around bringing FODMAP foods back into your diet. I get it! It's nerve-wracking to start eating foods that might make you feel bad again, and the whole thing can seem overwhelming and complicated. But that's because you've heard myths that are based in 100% fear and 0% fact - and that's just plain destructive! So let's bust these myths that are holding you back from seeing how capable you are of getting control your IBS triggers and confidently enjoying food again! "I'm struggling with everything about this diet." "I hate missing out on all the foods I love." "I'm tired of eating the same four things." I understand how comforting it is when avoiding all FODMAPs 24/7 brings relief, but there's no need to eliminate so many foods forever. You can have the same freedom from symptoms AND so much more freedom in what you eat. When they reintroduce high-FODMAP foods, my Free To Eat members love discovering the old favorites they can eat and remain symptom free. Personally, I learned that having wheat occasionally doesn't have negative effects. I'm absolutely thrilled that I can whip up my favorite pizza and enjoy every bite! And even if you do learn that garlic triggers your symptoms in larger servings, you might learn that a small amount is just fine. It makes it a lot easier to eat out when you're not worried about every possible smidgen! You don't have to cancel your social or travel plans to reintroduce FODMAPs. If you go out to dinner every Wednesday with your girlfriends, you don't have to stand them up. If you go to your cousin's birthday party you don't have to awkwardly avoid food all night. 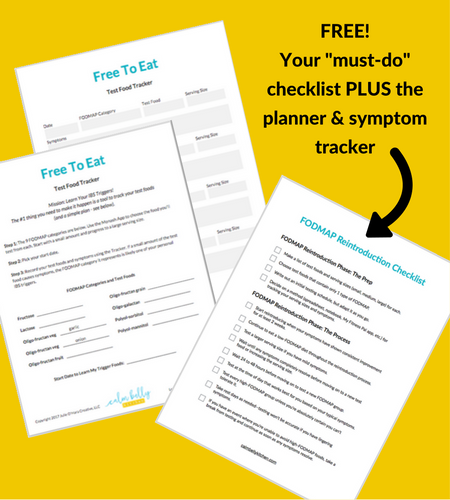 It's possible to fit the FODMAP testing around YOUR calendar. Don't let the urge to be perfect keep you from ever getting started. It's so easy to fall into this trap. I know because I did it too. In order to finally get going with the reintroduction process, I had to accept that there was no "perfect" time to do it. But once I actually started, it was easier to fit into my life than I imagined. I could take a break from testing if I needed to, and I didn't have to cancel any vacations or birthday dinners. Polyols (you'll test 2 individual polyols). 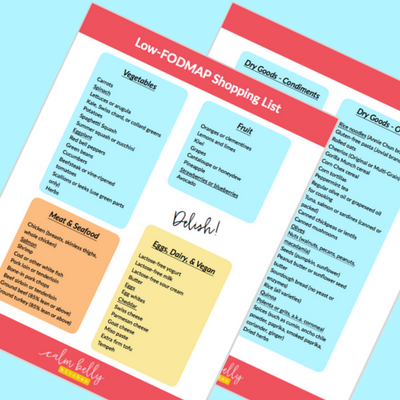 If you dig the science-y aspect of FODMAPs and can't wait to get started, great! And if all that lingo makes your head swim, you're still in the right place. All this means is that there's a strategic, easy to follow method that's designed to get you answers without complicating your life or sending you down a google rabbit hole. How do you test strategically? By testing foods that contain only 1 type of FODMAP. Since apples contain both fructose and polyols, they wouldn't be a good test food - It would be impossible to tell which FODMAP in that apple is responsible for your symptoms. Once you've learned which FODMAP categories are triggers for your body, you'll be able to determine your tolerance for other foods in those categories. If you choose, you can continue doing individualized experiments to your heart's content (more on that in #5). Here's how it works: You test a FODMAP group and learn how well you tolerate it. But what if your results aren't so black and white? What if 1 Tbsp of a food gives you some mild symptoms, but when you test 2 Tbsp you strangely have no symptoms at all? What the heck!? Is your body highly predictable, always reacting the same way all the time? For the majority of us, the answer is no. Yes, it's frustrating, but the trick is to treat every test as an experiment that gives you more and more info to work with. So what do you do next? You have a lot of options because the testing process is flexible and adaptable. You can do the test again. You can wait and repeat it later. You can use a different test food. The important thing is to be patient with your body and not give up. Your first try doesn't have to be a perfect slam dunk to be useful. Gathering more data over time WILL help you see the important patterns for your symptoms. The fact is, your diet can change as much as you want it to. When testing is done and you feel satisfied with the data you've collected, the real fun begins. You take what you learned and use it to design a personalized eating style that puts you 100% in control of your symptoms, now and for the future! You have no more mystery symptoms, no more anxiously flipping back through your day and wondering what caused your discomfort. You can have a calm belly, and eat your perfect mix of high and low FODMAP foods that keeps your IBS in check. And let's be real: This isn't about eating perfectly, it's about having the knowledge to make the right choices for you. Even if you're certain it will give you symptoms, you can choose to eat ice cream when you really want it! If some symptoms is worth the joy of ice cream, you get to choose that. Either way, you have less anxiety and are finally in control of your symptoms. Can I get a YES! FINALLY!!! See, those myths aren't so scary once they've been busted. And they definitely don't have to hold you back!